free stuff – download and enjoy! I’ve spent much time creating free tools for electronic music and audio engineering, starting in 1991 with SoundHack and more recently with a series of plugins and externals for Mac, Linux and Windows. This software is born from a desire to make available more interesting, esoteric and creative tools to musicians, sound designers and audio engineers. AAX versions are available for purchase from the aax page. 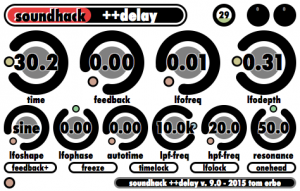 William Brent, Daniel Arias, Bryan Oczkowski, Trevor LeVieux and I have been spending some of the last two summers porting the SoundHack plugins to Pd and Max/MSP format. We have now ported 11 plugins to Pd (Macintosh, Windows and Linux) and Max/MSP (Macintosh and Windows). 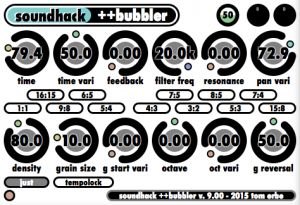 Version 7 features +binaural, +morphfilter, +spectralcompand, +spectralgate, +decimate, +chebyshev, +matrix, +compand, +delay, +pitchdelay and +bubbler. These are compiled externals with help files. Please send any bug report back to. Thanks! Spectral Sound Processing for the Macintosh. My original application still ticking, still swooshing, still awfully useful (original release October 26, 1991).